The case of all-stainless steel liquid filled gauge is usually made of 304stainless steel, while the internal structure is made of 316stainless steel. It's widely used for hydraulic compressors, compressed air system and pneumatic systems and fluid medium that does not clog connection port or brass. And it is available in corrosive conditions. All-stainless steel case liquid filled gauge is anti-seismic. In normal circumstances, it itself is protected from the vibration and pulsation. All-stainless steel liquid filled gauge has two advantages. It is of high quality and its service life is long. Its price is competitive. By the way, its good performance relies entirely on our factory's production process. All-stainless steel liquid filled gauge has passed ISO9001:2008 certification. 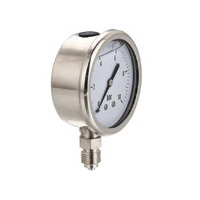 Exact Instrument Co., Ltd is a professional manufacturer and supplier of pressure gauge in China. Our company can offer OEM business according to clients' requirements.